There rarely seem to be enough hours in the day. Give me just a little more time, and we’ll dig into one of my most treasured record finds. 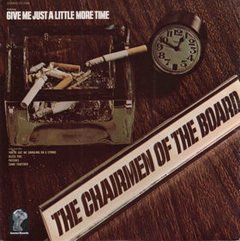 When I started listening to Top 40 AM radio in 1970, one of my faves was “Give Me Just A Little More Time” by the Chairmen of the Board. For years, that was only song I knew by that group. The Chairmen of the Board was fronted by General Norman Johnson, whose vocals are so memorable on that song. Harrison Kennedy, Danny Woods and Eddie Custis rounded out this powerhouse quartet. It was assembled by songwriting and production greats Brian Holland, Lamont Dozier and Edward Holland Jr. after they left Motown in the late ’60s to start the Invictus and Hot Wax labels. “Give Me Just A Little More Time,” “Come Together,” “Bless You,” “Patches” “Since The Days Of Pigtails & Fairytales” and “I’ll Come Crawling,” the Chairmen of the Board, from “The Chairmen of The Board,” 1970. This is Side 1. It runs 18:14. It’s out of print. That side starts with the smash hit. Then a Beatles cover with Kennedy on lead vocal. Then a fine deep cut, a slice of sweet pop-soul. Then the original version of “Patches,” shortly thereafter so memorably covered by Clarence Carter. Then the B side to that smash hit, which features Woods on lead vocal, and which my friend Larry over at Funky 16 Corners has certified as “smoking hot” and “a killer.” And finally another fine deep cut and the B side to the second single. The songwriting credits for five of this record’s 12 cuts read Edythe Wayne. That’s a pseudonym for Holland-Dozier-Holland, necessary because of their legal battle with Motown (over money, of course). Ron Dunbar, who worked for H-D-H, gets co-writing credits on seven cuts. He wrote “Patches” with Johnson. The Funk Brothers were the backing band. Is it any wonder these songs are so good? If you connect the dots, they go from the Four Tops, whom H-D-H often worked with at Motown, to the Chairmen of the Board. Both featured a distinctive lead singer and three versatile sidemen. Both groups’ LPs blend H-D-H originals with well-chosen covers. It’s interesting to listen to this apparent evolution of the Four Tops sound and recall that it came at the same time Norman Whitfield was taking both groups’ peers, the Temptations, in a much grittier, funkier direction.